As you define–and refine! !–your online course offering, a primary consideration is how the course fits into your business and your existing (or future) product portfolio. Make sure the course you create is one you can have success with now–and that can pave the way for future successes. Is this course going to be your flagship product? Or is it an entry-level offering that introduces students to you, hopefully then moving them on to taking other courses? Does this course stand alone or is it a part of a learning series? The answers to these questions are going to affect the scope of your class, the features you include, the amount of hand-holding you do, and even what you name your course. First: Your course offering needs to make sense in the context of your business and your other products. Here’s a picture I took the other day after meeting a friend for breakfast. 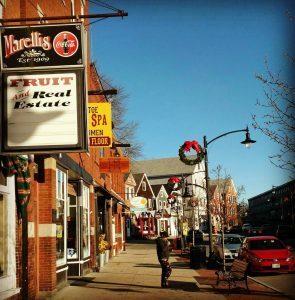 That sign for Marelli’s Fruit & Real Estate has been there since I came to New Hampshire over 25 years ago. Fruit AND real estate? The two don’t make sense together. But, the store is on a busy street and across from mills full of apartments, and it looks to me they're succeeding with newspaper, wine, and limited grocery offerings despite the promise on the sign. This is not, however, a good approach for a new business. Your course needs to make sense within your business. So what are you already offering? Or what do you plan to offer in the furture? How will your course complement this existing (or intended) business? Stop to think about where you are right now. Is this course your first offering ever? Do you already sell other courses that it will sit alongside? Are you going to use online courses to complement or replace other services or products? All of that matters and needs to make sense. Here are five models to give you a starting place for thinking about your course and product portfolio. One approach to building your course portfolio is the “chocolate-box” assortment: “chocolate box” like the sampler box that has one piece of chocolate filled with cream, another that’s dark chocolate, another with nuts, and yet another that’s got fruit in it. It's a mix. They're all candy with chocolate — but they don't progress or build on one another. Good examples of chocolate-box course portfolios can be found at sites like Udemy or Skillshare or Craftsy. 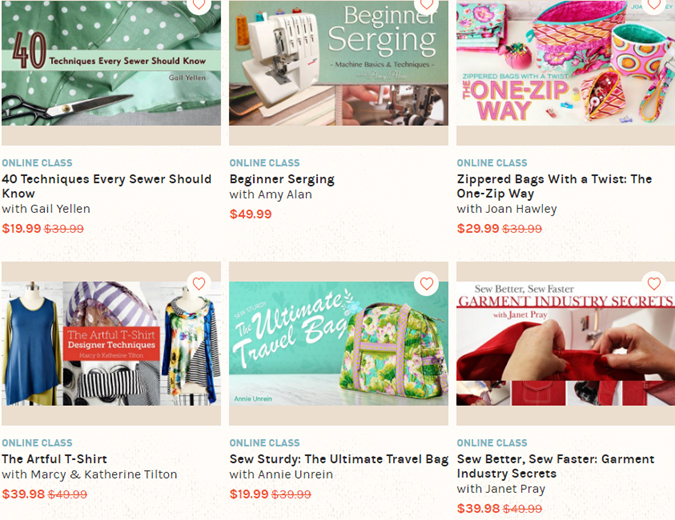 This is a look at a few of the sewing courses at Craftsy. There’s a course on serging and one on making a zippered bag. Another is for making t-shirts, and yet another shares secrets from the garment industry for sewing faster. They all have sewing in common but that’s where the commonality ends. While the chocolate box assortment is a series of classes broadly collected, the related assortment offers classes presented from logically-related angles on your topic. There’s a commonality in the approach. These are the logos from the very first courses I created and taught at Get It Scrapped: Scrapbooking Events, Scrapbooking Your Story, Scrapbooking Everyday Life, and Scrapbooking Travel and Vacation. They’re all about scrapbooking a particular focused subject matter. As another example, if you were teaching dog grooming, you might do a related series that includes Grooming Small Dogs, Grooming Large Dogs, Grooming Long-Haired Dogs. So with the related assortment, you offer several courses all coming from a particular angle–but specialized. They build on a theme and give your students choices so they can choose what best fit their skills and needs. Another assortment of classes you could develop in your portfolio is the progressive series. Use this when you’re teaching techniques that get progressively more complex and that build upon pre-requisite knowledge. Here, the examples are Copic Coloring (the first class in the series). Then comes Copic Coloring 2, and then Copic Coloring 3. (These are courses Michelle Houghton taught at Get It Scrapped a few years ago.) You can use the first class to get your students working with you on a topic. Then you keep working with them as you expand their expertise with your classes. Sometimes we want to put everything ALL into one class, but that makes the cost of the class higher–and it increases the amount of effort it takes for you to create the class and your students to complete it. Consider breaking it up, instead. Get folks in at a lower cost and give them work with which you know they can happily succeed. THEN offer them another. And another. So what’s are your potential progressive series? Think now about a hybrid approach. 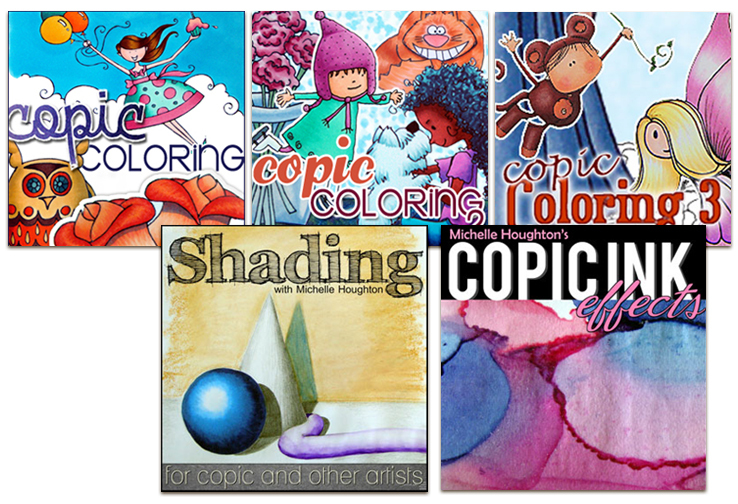 That initial progressive series—like the Copic Coloring classes I showed—can prepare students for a variety classes that build on those initial skills. The teacher of the copic classes at my site Get It Scrapped moved on to teach advanced classes on topics like Copic Shading and Copic Ink effects. So what advanced topics could you teach once you’ve got a progressive or related series established? These would be classes that are a natural progression from the first class, building upon the early skills you teach, but not necessarily pre-requisites for other classes. Here’s an example from Natasha Vorompiova at Systems Rock. She’s got a collection of related courses on different software tools for planning and project management. 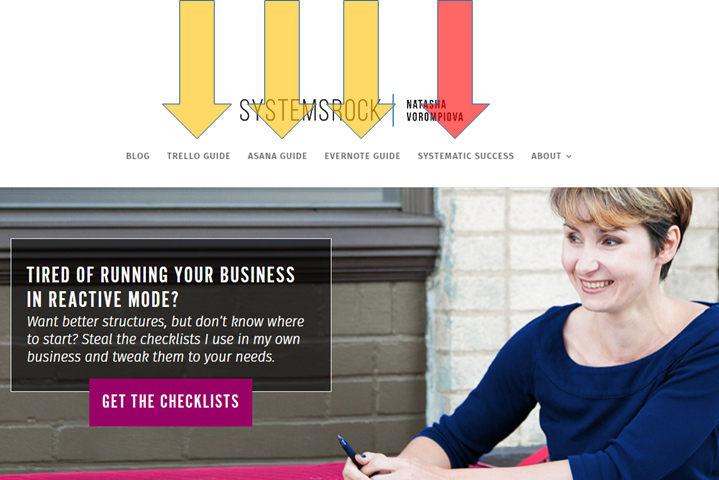 There’s Trello Guide and Asana Guide and Evernote Guide—courses that can pull in people who might well be interested in a bigger class, one on business systems organization and management which she calls Systematic Success. Think also about creating a progression of classes that progress not only in content and skills required but in price. This is a way to bring students in with a lower priced offering so they can get to know you and how you teach—and so they can move their own skills forward–so that they are ready for and open to your higher priced offering. At Teach What You Do, I offer simpler classes under $50, and then Jumpstart Your eCourse is $247. Finally, the eCourse Blueprint is a premium-priced course–but I allow students to apply their purchase price of Jumpstart Your eCourse to the eCourse Blueprint. So what's YOUR best portfolio approach? Now it’s time to ask yourself some questions about your own plans and possibilities for building a portfolio of classes within your business. How does the course you’re planning now fit into a portfolio? What are the portfolio possibilities for your business? Are you in the early stages and do you want to start with small assorted or progressive classes and then ramp up to a bigger class? Or do you want to start with a big signature class? 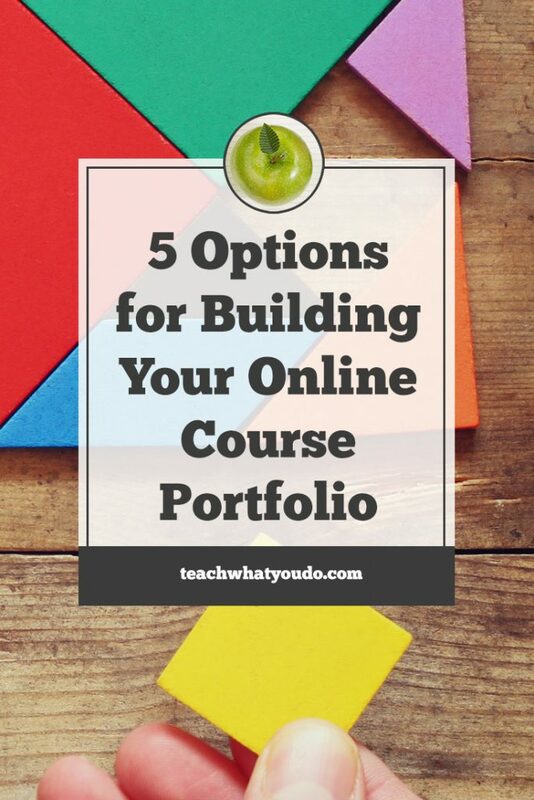 What implications does planning a portfolio have for your current course scope and content? With these questions in mind and the examples here, sit down now and make lists for possible courses and portfolio combinations you could offer. This will give you a foundation for thinking of your next courses' success and for growing your business.